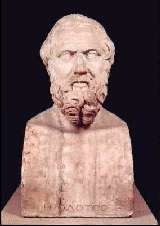 Herodotus is credited as the father of history. The exact dates of his birth and death are not known, but it is probable that his family was wealthy. Some believe that he was related to the epic poet Panyassis. He was exiled from Halicarnassus by the tyrant Lygdamis for conspiracy against Persian rule. After his exile, he spent a considerable length of time on the island of Samos. He then traveled to Asia Minor, Greece, Egypt, and Babylonia. Throughout his travels, he was respected by many of the great thinkers of the day, including Pericles. At some point in his life, he returned to Halicarnassus to help restore constitutional government. About 447 B.C., he moved to a new colony, Thurii, in southern Italy that was sponsored by Athens. He died in this location and was buried in the market of this colony. During his time in Thurii, Herodotus completed The History, which is the first Western example of a secular prose narrative establishing strict chronology and causation. The work is divided into nine parts. The first books deal primarily with the history and culture of ancient people while the later books document the fifth century B.C. wars between Greece and Persia, which represent the eastern and western centers of the world. It is generally accepted that most of the information in the book was obtained by Herodotus from his experience during his travels earlier in his life.